The North Carolina Industrial Association (NCIA), an organization of African American civic leaders formed in 1879, was known primarily for its presentation of the annual North Carolina Industrial Fair from 1879 to 1930. The central purpose of the NCIA, as stated in its charter granted on 14 Mar. 1879 by the General Assembly, was "to encourage and promote the development of the industrial and educational resources of the colored people of North Carolina." The NCIA secured permission from federal government officials to hold the first fair in 1879 in the barracks buildings and grounds of Camp Russell near the site of the 1853-72 state fairs, east of Raleigh. Successive fairs continued there through 1890; the Confederate Soldiers' Home acquired the site that year. Afterward, the fair was held on North Carolina's official State Fairgrounds, beginning in most years during the week immediately following the "white" state fair each October. The New York pictorial publication Frank Leslie's Illustrated Newspaper sent two men to North Carolina to cover the first fair. 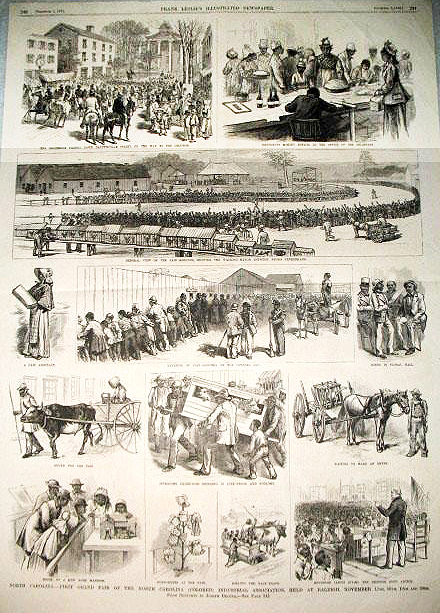 The 6 December issue featured a full page of sketches by the illustrator and the reporter's detailed description of the parade, competitions, educational exhibits, and entertainment features. Parades from Fayetteville Street to the grounds inaugurated opening day of the fair each year, and balls frequently closed the annual festivity. Some additional social events were fund-raisers for charities, the beneficiaries one year being St. Agnes and Leonard Hospitals in Raleigh. It became a custom for the state's governor to make a short opening address. Featured speakers over the years were other North Carolina officials, U.S. congressmen, African American leaders, and such widely known public figures as Frederick Douglass in 1880, Booker T. Washington in 1903, and black bank president Maggie L. Walker of Virginia in 1915. The final North Carolina Industrial Fair took place in October 1930, under the management of educator Charles N. Hunter, one of the founders of the association and the fair. Although preparations were partially under way for a 1931 fair, it did not materialize; Hunter died in Raleigh on 4 Sept. 1931. His biographer notes that the Raleigh News and Observer's report on the cancellation of the black fair included the statement that "Professor Hunter's death put a stop to the arrangements." John H. Haley, Charles N. Hunter and Race Relations in North Carolina (1987). Frenise A. Logan, "The Colored Industrial Association of North Carolina and Its Fair of 1886," NCHR 36 (January 1959). McKown, Harry. "November 1879 -- Colored Industrial Association Fair." This Month in North Carolina History (blog). November 2009. http://www.lib.unc.edu/ncc/ref/nchistory/nov2009/index.html (accessed November 15, 2012). Frank Leslie's Illustrated Newspaper, December 6, 1879. "An Act to Incorporate the North Carolina Industrial Association." Laws and resolutions of the State of North Carolina, passed by the General Assembly at its session of 1879. Raleigh [N.C.]: The Observer. 1879. p.799-800. http://digital.ncdcr.gov/u?/p249901coll22,197626 (accessed November 15, 2012). "Premium List of the North Carolina Industrial Association." Plans of Buildings, Rates and Regulations Governing Exhibitors at the North Carolina State Exposition Raleigh, N.C., October 1st to October 28th, 1884. Also Premium Lists of the North Carolina Agricultural Society and the North Carolina Industrial Association. Raleigh, N.C.: Edwards and Broughton. 1884. p.20-21. http://digital.ncdcr.gov/u?/p249901coll22,207522 (accessed November 15, 2012). "Newspaper Clipping, Accession #: H.1977.215.1." 1879. North Carolina Museum of History.